Yes, it’s that glorious time of year again: six weeks of glorious indulgence, starting with Thanksgiving and rolling through New Year’s. 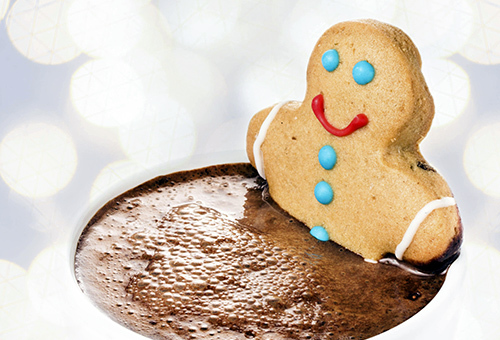 Combine ample decadent treats with hectic shopping, end-of-the-year work deadlines and “I deserve to take a break” syndrome, and you’ve got a recipe for holiday weight gain that can undo your entire year of progress. But don’t fret: Success can be yours with these tips to enjoy the holiday season without it being hazardous to your waistline. Stay in the Zone: Exercise and diet are as important as ever over the holidays, if not more so, because you’ll surely succumb to at least a few treats at a holiday party or family gathering. And that’s OK – you didn’t get in shape with a Spartan lifestyle, but with moderation and consistency. So stay in the zone by staying consistent: enjoy the holidays, but don’t abandon the habits and dedication you’ve displayed for the past nearly-11 months. Don’t overeat. Don’t ignore the gym. Don’t “give up” when you’ve come so far. Give a Gift (to Yourself): Stress can be the operative word around the holidays, for all the reasons mentioned at the beginning of this article (deadlines, shopping, etc.). And when it comes to weight gain, stress can be the trigger, biochemically and mentally. Stress triggers the production of cortisol, the so-called “stress hormone,” and cortisol can lead to weight gain, among other health issues. Stress also “weighs you down,” making you more likely to curl up on the couch with a gallon of ice cream than hit the gym. So give yourself a stress-relieving gift while you’re out shopping for family, friends and loved ones: a massage, a trip to the movies, or even just a long, hot, relaxing bath before bed can do wonders. Take It Step by Step: Your quest for health and wellness is an evolving journey, not a single leap; it’s a day-by-day, step-by-step process. Use that same philosophy over the holidays to stay active, even when you find it difficult to stick to your standard exercise routine. Holiday shopping at the mall? Escape the packed lots by parking in an open space and walk to the stores, no matter the distance (within reason). Why drive around for hours attempting to find that open space up front when you can escape the stress – and get some exercise – by parking farther away? Family in town? Catch up on old times while taking a nature hike or walking around town. The holidays don’t have to be hazardous to your waistline if you remember what you’ve been telling yourself all year long: I’m in control. Don’t lose control this holiday season, no matter how hectic things get. You’re in control, so stay strong and stay healthy – you deserve it. After all, your New Year’s Resolutions should never say, “Lose the weight I regained over the holidays” again.